House of Chiropractic is conveniently located in The Preserve at 2050 North Loop West which is just off 610 and East TC Jester. 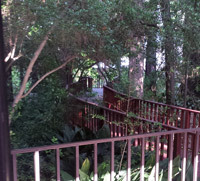 You will find plenty of free parking on both sides of our suite. Upon entering Suite 223, you will be greeted by Erin, our office manager. Erin will assist you with any questions and handle all of your insurance needs. Our new patient forms can be downloaded from this site. Relax in the comfortable living room while you fill out some simple paperwork. We don’t call it a waiting room since we work hard to schedule you so you don’t have to wait. Prepare to spend from one to one and a half hours for your first visit. Wear loosely fitted clothing so you will be comfortable during the examination. 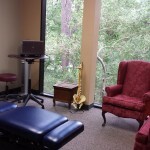 Our comfortable, nurturing environment enhances your healing process. Dr. Thompson will explain the process which begins with discussing your current problem, your health history, and what you hope to achieve. The examination starts with a check of your posture followed by testing your reflexes, muscle strength, flexibility and range of motion. Additional testing procedures designed to pinpoint the cause of your pain or problem may be employed. If needed, spinal x-rays may be ordered. During the examination and subsequent treatment, Dr. Thompson will explain what she is doing and why in order to alleviate any fear or anxiety about the process. Your initial care may involve stretching, ice, muscle work or massage, and adjustments to relieve pressure and pain. 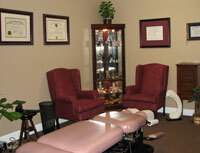 After treatment, Dr. Thompson will review all instructions/recommendations and answer any questions you may have. Your progress depends a great deal upon your willingness to follow her advice.